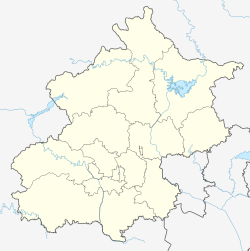 Zhoukoudian or Choukoutien (周口店) is a cave system in suburban Fangshan District, Beijing. It has yielded many archaeological discoveries, including one of the first specimens of Homo erectus (Homo erectus pekinensis), dubbed Peking Man, and a fine assemblage of bones of the gigantic hyena Pachycrocuta brevirostris. Due to differing interpretations of the evidence, proposed dates for when Peking Man inhabited this site vary greatly, with : 700,000-200,000 years ago, 670,000-470,000 years ago and no earlier than 530,000 years ago. 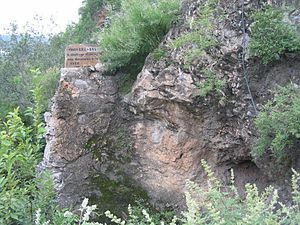 The Peking Man Site was first discovered by Johan Gunnar Andersson in 1921 and was first excavated by Otto Zdansky in 1921 and 1923 unearthing two human teeth. These were later identified by Davidson Black as belonging to a previously unknown species and extensive excavations followed. Fissures in the limestone containing middle Pleistocene deposits have yielded the remains of about 45 individuals as well as animal remains and stone flake and chopping tools. The oldest animal remains date from as early as 690,000 years ago and tools from 670,000 years ago while another authority dates the tools found from no earlier than 530,000 years ago. During the Upper Palaeolithic, the site was re-occupied and remains of Homo sapiens and its stone and bone tools have also been recovered from the Upper Cave. The crater Choukoutien on asteroid 243 Ida was named after the location. 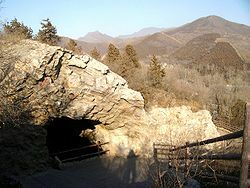 The caves are located in Fangshan District, southwest of central Beijing. Zhoukoudian Peking Man Site - the Museum. At the centre: Bust of reconstructed Peking Man. Swedish geologist Johan Gunnar Andersson first started his explorations of the region in 1918 at an area called Chicken-bone Hill by locals who had misidentified the rodent fossils that were found in abundance there, but it was not until 1921 that he and American palaeontologist Walter W. Granger were led to the site known as Dragon Bone Hill by local quarry men. Noticing some white quartz that was foreign to the area he immediately realised that this would be a good place to search for the remains of primitive man. Excavations were undertaken by Andersson's assistant Austrian palaeontologist Otto Zdansky in 1921 and 1923 unearthing a great deal of material that was sent back to Uppsala University in Sweden for further analysis. In 1926 Anderson announced the discovery of two human molars amongst this material and the following year Zdansky published his finding cautiously identifying the teeth as ?Homo sp. Canis c.f. variabilis, commonly known as the Zhoukoudian wolf, were found at the Zhoukoudian cave system and archaeological site in 1934 and named by its discoverer, Pei Wenzhong. Canadian paleoanthropologist Davidson Black, who was working for the Peking Union Medical College at the time, was excited by Andersson and Zdansky's find and applied to the Rockefeller Foundation for funding to undertake a systematic excavation of the site. Funding was granted and the Zhoukoudian Project commenced excavations in 1927 under the supervision of Chinese archaeologist Li Jie. That fall, a tooth was unearthed by Swedish paleontologist Anders Birger Bohlin for which Black proposed belonged a new species named Sinanthropus pekinensis. The following year Black's excavations uncovered more fossils of his new species including teeth, a substantial part of a juvenile's jaw and an adult jaw complete with three teeth. These finds allowed Black to secure an extra $80,000 grant from the Foundation which he used to establish a research laboratory. The Cenozoic Research Laboratory of the Geological Survey of China was established at the Peking Union Medical College in 1928 with the assistance of Chinese geologists Ding Wenjiang and Weng Wenhao for the research and appraisal of the fossils unearthed. Black stayed on at the Laboratory as honorary director while excavations continued at the site under Chinese paleontologist Yang Zhongjian, anthropologists Pei Wenzhong and Jia Lanpo. Conditions at the site were primitive, with scientists having to ride out to the excavation on mules and staying at caravansaries along the way. When the first skullcap was unearthed at the site in 1929, it was done by Pei, working in a 40-meter crevasse in frigid weather with a hammer in one hand and a candle in the other. A second skullcap was discovered close to the first in 1930 and by 1932 nearly 100 workers were deployed at the site each day. Despite the conditions at the site eminent researchers continued to visit. French palaeontologist Pierre Teilhard de Chardin had been a regular visitor to the site since 1926. French archaeologist Henri Breuil visited in 1931 and confirmed the presence of stone tools. That same year evidence of the use of fire at the cave was accepted. The workaholic Black died one night at his office in 1934, with one of the skullcaps unearthed at the site on his desk. German Jewish anthropologist Franz Weidenreich replaced him as honorary director of the Laboratory and excavations continued uncovering a further three skullcaps in 1936. Altogether excavations uncovered 200 human fossils from more than 40 individuals including 5 nearly complete skullcaps before they were brought to a halt in 1937 by the Japanese invasion of China. Reports of Japanese atrocities include the torture and murder of workers at the site, with three bayoneted to death and a fourth forced to pull a rickshaw until dying of starvation. In 1941 the bulk of the finds were lost, never to be recovered, while being transported to safety. Fortunately, Weidenreich had made copies of the fossils to preserve their physical characteristics. Excavation work was recommenced in 1949 unearthing new Peking Man fossils including 5 teeth and fragments of thigh and shin bone. The following year a third premolar was discovered in the material sent back to Uppsala by Zdansky in 1921 and 1923. The Peking Man Site is designated type section of cave deposits of Middle Pleistocene in North China by the Annual Congress of the National Committee of Stratigraphy of China 1959 and a mandible fragment is unearthed. Excavations led by Pei in 1966 unearthed a premolar and two pieces of skull fragment, these were discovered to match fragments retained from previous excavations in 1934 and 1936, and the only extant example of a nearly complete skullcap was pieced together. Excavations at Locality 4 in Zhoukoudian, from 1972–73, unearth a Homo sapiens premolar. Modern scientific dating techniques confirm that the site was occupied between 500,000 and 230,000 years ago. Locality 1, also known as Peking Man Site, was the first to be discovered in 1921 under the direction of local quarry men. The site was originally a natural limestone cave although the roof had long since collapsed spreading a layer of breccia and rubble across the top of the deposits. Early excavations in 1921 and 1923 revealed evidence of human habitation from 500,000 to 200,000 years ago. 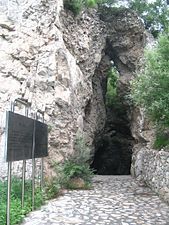 The cave was excavated from 1927-37 yielding 200 human fossils (from 40 individuals) identified as Homo erectus, more than 10,000 pieces of stoneware, several cinder layers indicating fire use in early man, as well as animal fossils from 200 separate species. Tragically the bulk of this material was lost in 1941 during the Japanese Occupation and has never been recovered. Excavations recommenced in 1949 and continued to yield fossils and artefacts making this site one of the most fruitful sources of material from the Middle Pleistocene era. A total of 13 layers have been excavated at the site to a depth of nearly 40 m.
Layers below this have been shown by test-pit drilling to not contain fossils or stoneware and have never been excavated. Part of Peking Man Site this slope was excavated 1930–58 and again in 1978–79 by a multi-disciplinary research mission. Excavation have dug to a depth of 7m through Layers 3-6 and have unearthed stone tools, burned bones and ashes, and fossils of bird, reptile and mammal species. 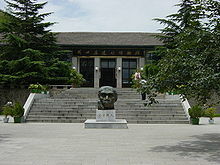 Pigeon Hall was named in honour of its frequent visitors and was connected with Peking Man Site by workmen in 1928. Excavations from 1930-31 unearthed numerous Peking Man bones (including mandible, clavicle and parietal bone), signs of fire use (including a scorched redbud stick), and stone tools of quartz and green sandstone. Situated on the upper part of Dragon Bone Hill this cave was discovered in 1930 and excavated from 1933–34 during which time the roof and north facing opening were removed. Excavations found evidence of human habitation in the cave dating back to 10,000 to 20,000 years ago. The cave was divided into an upper level living quarters and a lower level burial ground, while a small recess on the lower level acted as a natural animal trap. Finds unearthed included three human skulls and other remains from at least eight individuals identified as Archaic Homo sapiens, tools and ornaments made from stone and bone, and numerous animal bones including complete skeletons of large mammals caught in the lower level trap. Also white powder sprinkled around the remains on the lower level indicates the inhabitants practiced burial rites. More than 20 fossil bearing localities have been excavated in Zhoukoudian to date. This north-south running fissure is filled with red binder soil and dates to the Middle Pleistocene era. Excavations in 1921 concurrent with those at Peking Man Site unearthed mammalian fossils including hamster, rhino and Chinese hyena. Discovered in 1927 this east-west running fissure is filled with breccia and dates to the late Middle Pleistocene era. Excavations in 1933 unearthed mammalian fossils including porcupine, racoon dog and badger. Discovered in 1927 this north-south running fissure is filled with yellow sandy clay and dates to the late Middle Pleistocene era. Excavations from 1937–38 unearthed stoneware, burned bones and seeds (indicating fire use in early man) and fossils of jackal and deer. A second excavation in 1973 unearthed a human premolar and the fossilised remains of 40 mammalian species including macaque, pig, bear and horse. This deposit, located 60m above the riverbed, is filled with layers of sand and gravel and dates to the late Early Pliocene era. Excavations from 1937-38 unearthed mammalian fossils including civet and bamboo rat. Discovered in 1967, this cave connects with Locality 4 to its south. The deposits formed by hydrostatic sedimentation in stagnant water conditions contained no fossils or human related artefacts. Discovered in 1933, when Locality 3 was being excavated, this column shaped corrosion pit is filled with red grit and dates to the late Early Pleistocene era. Excavations unearthed fossils of 22 mammalian species including sabre-toothed tiger and an extinct primate. 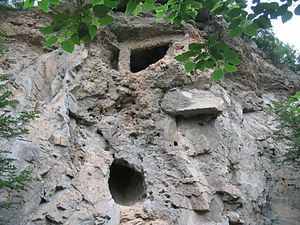 This fissure in a limestone mound 1 km south of Peking Man Site dates to the early Middle Pleistocene era and is the earliest site of cultural remains excavated so far at Zhoukoudian. Excavations of the thin-bedded sandy clay about 50m above the river bed have unearthed stone artefacts, ash and charred bones and 36 species of deeply fossilised mammalian fossils including thick-jawed giant deer and sabre-toothed tiger. 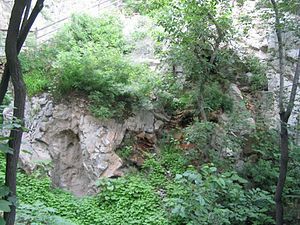 This narrow limestone cave 1.5 km (0.93 mi) south of Peking Man Site dates to the Early Pliocene era and has yielded some of Zhoukoudian oldest fossils, dating back 5 million years. Excavations, in 1933, 1951 and 1953, of the thin-bedded fine sandstone about 70m above the river bed have unearthed more than 600 nearly complete fish fossils of four different species, two of which are now extinct. Discovered in 1932 this relatively young site dates to around 100,000 to 200,000 years ago. Excavations from 1934–35 revealed three layers; an upper layer of loess and limestone debris; a middle layer containing ash, stoneware, burned bones and hackberry seeds; and a lower layer of red clay containing stoneware and bird and mammalian fossils including woolly rhino, giant deer and gazelle. The site has yet to be fully excavated. Wikimedia Commons has media related to Zhoukoudian. ^ "The Peking Man World Heritage Site at Zhoukoudian". UNESCO. Retrieved 2008-04-20. In February 1918, Johann Gunnar Andersson, a famous Swedish geologist and archaeologist, was told that there were some fossils at what was called Chicken-bone Hill near Zhoukoudian. He was then serving as an adviser on mineral affairs in the Ministry of Agriculture and Commerce of the Chinese Government. He showed much interest and, in the following month, made a survey at the hill where a lot of rodent fossil was collected. The rodent fossil was taken as chicken bones by local people and the Chicken-bone Hill was so named. The latter is nominated later as Locality 6 of the Peking Man Site. This discovery of the locality is not so important, but the survey led to a series of investigations in the region. ^ "Review of the History". Peking Man Site Museum. In 1926 a human premolar was found among the material from the Peking Man Site during preparation in the laboratory in Uppsala, Sweden. Andersson announced the discovery in October in Beijing. ^ "Review of the History". Peking Man Site Museum. Under support of Rockefeller Foundation, the excavation at Zhoukoudian started on a large scale in 1927. A well-preserved human molar was found. Davidson Black proposed a new genus and a new species, Sinathropus pekinensis, for the human teeth found at Peking Man Site. ^ "Review of the History". Peking Man Site Museum. During the field season of 1928, numerous isolated teeth, the greater part of a juvenile jaw and an adult jaw fragment with three molars were discovered. ^ Melvin, Sheila (October 11, 2005). "Archaeology: Peking Man, still missing and missed". International Herald Tribune. Retrieved 2008-04-20. The scientists who worked on the excavation rode to the site on mules and stayed in an old caravansary. The first skullcap was dug out by Pei Wenzhong working in a 40-meter crevasse in frigid weather with a hammer in one hand and a candle in the other. ^ "The Peking Man World Heritage Site at Zhoukoudian". UNESCO. Retrieved 2008-04-20. Just after the discovery of the first skullcap of Peking Man, the second skullcap was discovered in the spring of 1930. It was found and restored from a block of sediments from locus nearby that of the first skullcap and brought back to the Cenozoic Research Laboratory. ^ "The Peking Man World Heritage Site at Zhoukoudian". UNESCO. Retrieved 2008-04-20. In 1932, the scale of the excavation was large and daily employment of workers was more than one hundred. Within a square kilometre sphere, excavation of different loci was often carried out simultaneously. ^ "Review of the History". Peking Man Site Museum. Henri Breuil, a French archaeologist, was invited to visit the site in 1931, he confirmed the existence of stone tools at Peking Man Site. In the same year, the evidence of the use of fire at this cave was accepted by the anthropological circle. ^ Melvin, Sheila (October 11, 2005). "Archaeology: Peking Man, still missing and missed". International Herald Tribune. Retrieved 2008-04-20. Black died at his office desk in the middle of the night with a skullcap of Peking Man beside him. ^ "The Peking Man World Heritage Site at Zhoukoudian". UNESCO. Retrieved 2008-04-20. Since 1935, excavation was under the charge of Mr. Jia Lan-po, world famous archeologist. In the following excavations, the most fruitful year was in 1936, three complete skullcaps were unearthed. ^ "Review of the History". Peking Man Site Museum. During 1927-1937, abundant human and animal fossils as well as artefact were found at Peking Man Site, it made the site to be the most productive one of the Homo erectus sites of the same age all over the world. Other localities in the vicinity were also excavated almost at the same time. ^ Melvin, Sheila (October 11, 2005). "Archaeology: Peking Man, still missing and missed". International Herald Tribune. Retrieved 2008-04-20. Three Chinese workers at the site were tortured and then bayoneted to death by Japanese soldiers, and one worker was forced to drive a rickshaw and died of starvation. ^ "Review of the History". Peking Man Site Museum. During World War II, Peking Man fossils were lost in 1941. ^ "Review of the History". Peking Man Site Museum. But the fossils had been studied in great detail by Franz Weidenreich, a German Jewish anthropologist, whose publication on Peking Man provided most part of the knowledge of the physical characters of the earliest humans known by then. ^ "Review of the History". Peking Man Site Museum. The excavation work at Zhoukoudian site was resumed in 1949, 5 teeth and one piece of thighbone fragment as well as one piece of shinbone fragment of Peking Man were found. ^ "Review of the History". Peking Man Site Museum. In 1950, another premolar was found in the materials unearthed from the Peking Man Site, the materials were transported to Uppsala in the early 1920s. ^ "Review of the History". Peking Man Site Museum. Peking Man Site was designated as the type section of cave deposits of Middle Pleistocene in North China on the Annual Congress of National Committee of Stratigraphy of China in 1959. ^ "Review of the History". Peking Man Site Museum. A mandibular fragment of Peking Man was found in 1959. ^ "Review of the History". Peking Man Site Museum. Two pieces of cranial fragment and a premolar of Peking Man were found in 1966, these two skull fragment perfectly matched with the two pieces of skull fragment unearthed in 1934 (one of which was recognized in laboratory in 1936), they belong to the same individual. ^ "Review of the History". Peking Man Site Museum. A premolar of Homo sapiens was found at Locality 4 of Zhoukoudian during 1972-1973. ^ Wendy Conklin. "Mysteries in History: World History". Peking Man Site Museum. Each set belonged to a dif ferent Peking man. They were more than 500,000 years old. With these bones, scientists were able to figure out what this Peking Man looked like. ^ "Peking Man Site". Peking Man Site Museum. 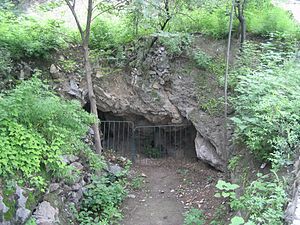 Peking Man Site, or the Locality 1, at Zhoukoudian, was originally a natural limestone cave. The Peking Man, from about fix or six hundred thousand years ago, claimed here as their home. They lived Zhoukoudian discontinuously until about 200,000 years ago, and their remains, relics as well as the rock off from the cave roof and bedload from outside the cave deposited in the cave layer by layer. Eventually, thick deposits have come into being, which are some 140 meters long from the east to west, 2m to 40m wide from south to north, 40-plus meters thick, and composed of 13 layers. ^ "Peking Man Site". Peking Man Site Museum. Discovered in 1921, this site had been excavated systematically from 1927 to 1937 when the July 7th Incident of 1937 broke out. The excavation restored after liberation. Over the past decades, the middle section (about 27,000m³) of the deposit was excavated, from which nearly 200 human fossils (belong to 40 ape men), more than 10,000 pieces of stoneware, several cinder layers as well as animal fossils of almost 200 species have been discovered. Compared to other sites of the same era in the world, Peking Man Site boasts the most integral and richest findings and is the best representative of all ape-man sites, therefore playing an important and irreplaceable role in the scientific research and human being’s ancient culture history. ^ "Peking Man Site". Peking Man Site Museum. Before excavation, the roof of the cave had already collapsed, which became the breccia and rocks on the top of the deposits. In the process of digging, all holes were dug out except for the Pigeon Hole in the east, which was cemented too hard to be removed. ^ "Description of the profile". Peking Man Site Museum. Layers 1-2: Breccia containing travertine, about 4m thick. Layer 3: Coarse breccia, containing huge limestone blocks, formed by the roof collapse. 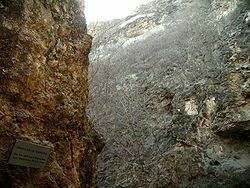 A skull of Peking Man was found from this layer in 1966. Layer 4: Laminated ashy layer (Upper Cultural Zone) containing burned bones and stones, as well as huge limestone blocks, about 6m thick. Layer 5: Stalagmite layer, about 1m thick. Layer 6: Breccia, containing huge limestone blocks and hyena coprolites, about 5m thick. Layer 7: Sandy layer, about 2m thick. Layers 8-9: Breccia containing ash (Lower Cultural Zone), about half of Peking Man fossil assemblage was found from the layers, about 6m thick. Layer 10: Reddish clay (upper part) and ash (lower part), about 2m thick. Layer 11: Breccia. The first skull of Peking Man was found from the layer corresponding to this one in 1929, about 2m thick. Layer 12: Reddish sandy layer about, 2m thick. Layer 13: Sand and clay containing boulders and hyena coprolites, about 2m thick. All of the layers mentioned above contain fossils and contain stone artefacts except Layer 12. The deposit under the 13th layer was not excavated and only known from the test pit without fossil and stone artefact. ^ "The excavated area of The east slope". Peking Man Site Museum. The East Slope is one part of Peking Man site, and it once was excavated during 1930-1958. The most recent excavation was conducted during the mission (1978–1979) of the multi-disciplinary synthetic researches at the site. The excavate area is 20 meters long, 16 meters wide from north to south, and 7 meters deep; approximately 320 square meters of surface. In stratigraphy, the excavated part can be correlated with the layers 3-6, among which the 4th layer is the ash-layer and the other layers are composed of well cemented breccias. The animal fossils recovered include mammals, reptiles and birds. Some stone tools, burned bones and ashes left by humans were also unearthed. ^ "Pigeon Hall". Peking Man Site Museum. Pigeon Hall was named for its frequent visit by pigeons. The northern wall is made of limestone. Two holes were made on the east side of the wall for the purpose of collecting stones and burnt limes. The cave roof and southern wall contain petrous breccia with fossils. In 1928, when the Locality 1 was being excavated, workers connected the west end of the cave with Locality 1. It was excavate in 1930 and 1931 respectively. The most important finding here include fossils of clavicles, parietal bones, mandibles of ape-men, and lots of primary stone tools made of quartz and green sandstones. The four culture layers include the signs of ape-men's utilization of fire and large cinder layers, Particularly, a scorched stick of redbud tree was discovered in the Hall, whose geological age dates back to Middle Pleistocene, the same to that of Locality 1. ^ "Upper Cave". Peking Man Site Museum. This site was discovered in 1930, and excavated in 1933 and 1934. From 20,000 to 10,000 years before present the Upper Cave Man lived in the cave. The cave originally had a complete roof and a north facing opening, but these were removed during the excavation. The site consists of four parts, the entrance (collapsed), the upper chamber, the lower chamber and the lower recess. The upper chamber is a living floor, the lower chamber is a graveyard and the lower recess is a natural trap from which many complete skeletons of large mammals have been unearthed. ^ Noel T. Boaz, Russell L. Ciochen (2004). Dragon Bone Hill:An Ice-Age Saga. Oxford University Press. ISBN 0195152913. ^ "Upper Cave". Peking Man Site Museum. Three human skulls and other human fossils from at least 8 individuals, ornaments and tools made of bone and stone as well as animal bones were found in the cave. The white powder found around the human bones indicates that the inhabitants of upper cave already performed some form of burial rites for the dead. ^ "Locality 2". Peking Man Site Museum. Locality 2 was excavated in 1921 at the same time with Locality 1. The site was 2m-thick and 15m-high south-northward deposit. The deposits are mainly red binder soil containing calcareous concretions. Unearthed animal fossils include hamster, Chinese hyena, rhinoceros, megaloceros pachyosteus, sus lydekkeri, etc. The geological age dates back to Middle Pleistocene. ^ "Locality 3". Peking Man Site Museum. Discovered in 1927 and excavated in 1933, Locality 3 is a fissure filling deposit stretching from east to west. It is 8 meters long and less than 4 meters wide. The content of the deposit is breccia. The unearthed fossils cover 56 mammals such as zokor, porcupine, racoon dog, badger, tiger, bear, dear and so on. The geological age is late Middle Pleistocene. ^ "Locality 4". Peking Man Site Museum. Discovered in 1927, this locality was excavated during 1937-1938. 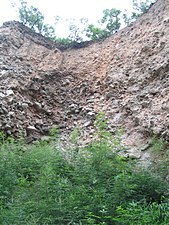 The fissure deposit extends in a north-south direction, and contains mainly yellow sandy clay with abundant limestone fragments. This excavation yielded lithic tools, evidence of fire used by early man (burned bones and burned seeds of hackberry trees) as well as mammalian fossils such as jackal (Cuon) and deer (Cervus). In 1973, a upper premolar of human's and other 40 additional mammalian species were discovered, including macaque (Macaca), mole-rat (Myospalax), bear (Ursus), horse (Equus cf. sanmeniensis), pig (Sus cf. lydekkeri), red deer (Cervus elaphus), and sika deer (Cervus grayi). The geological age is late Middle Pleistocene similar to that of the upper part of Locality 1. ^ "Cap Deposit". Peking Man Site Museum. The Cap Deposit is located at the 60 meters of the river bed of Ba’er River, which is mainly composed of gravel layers and sand layers. It was excavated between 1937 and 1938, and such animal fossils like prosipheus, rhizomys, Viverra peii etc. have been unearthed. The geological age is early Pliocene. ^ "Locality 4". Peking Man Site Museum. In 1967 a cavern to the north of Locality 4 was discovered, this cavern connects with Locality 4 and was named the "New Cave". Formed primarily under stagnant water condition, the deposits in the "New Cave" yielded neither fossils nor artefacts. ^ "Locality 12". Peking Man Site Museum. Locality 12 was discovered in 1933 when the Locality 3 was being excavated. Locality 12 is a column shaped corrosion pit with a diameter of about one meter. The substances in the pit are red grits. Twenty-two types of animal fossil are unearthed, such as procynocephalus wimani, sabre-toothed cat, postschaizo-therium chardini etc. The geological era is early Pleistocene. ^ "Locality 13". Peking Man Site Museum. Locality 13 lies on a limestone mound about 1km to the south of the Peking Man Site. 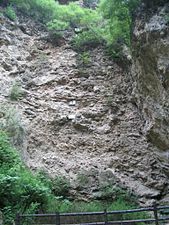 This fissure or cave was filled with deposits about 50 meters above the local river bed. Some stone artefacts and traces of using fire (ash layer and a few charred bones) were found as well. This is the earliest site of cultural remains so far excavated in Zhoukoudian area. Many deeply fossilised fossils were found from the thin-bedded sandy clay. There are 36 species of mammalian fossils, including thick-jawed giant deer (Megaloceros pachyosteus), sabretooth (Homotherium). Locality 13 is roughly equivalent to the lower part of the deposits of Peking Man Site in geological age, i.e. it's early Middle Pleistocene. ^ "Locality 14". Peking Man Site Museum. Locality 14 lies 1.5km to the south of the Peking Man Site. Originally it was a narrow and pocket-like limestone cave situated about 70 meters above the present riverbed. During the excavation in 1933, 1951 and 1953, more than 600 nearly complete fish fossils were unearthed from the thin-bedded fine sandstone. Many of the fishes are well preserved. These fishes can be attributed to four species: Matsya hsichihi, Barbus brevicephalus, Barbus szechuanensis and Barbus cf. yunnanensis, all of them are barbels. The former two species are extinct, whereas the latter two are still living today in the vast areas to the south of Changjian (Yangtze) river, such as Sichuan, Yunnan, Guangdong, Guangxi, Hainan, Fujian and Taiwan provinces. The fauna found at this locality is of Early Pliocene age (about 5 million years before present). ^ "Locality 15". Peking Man Site Museum. Discovered in 1932, Locality 15 was excavated during 1934-1935. The excavated part measures 16 meters long, 13 meters wide, and 10 meters thick, while other parts of the deposit have not been excavated. The deposit can be divided into three layers. The upper layer contains yellowish sandy clay with occasional limestone debris; the middle layer contains ash, big limestone blocks, seeds of hackberry trees, burned bones as well as lithic tools; the lower layer contains breccia with limestone blocks, bone fragments, lithic tools and red clay. This locality yielded bird fossils and 33 mammalian species, including mole-rat (Myospalax), woolly rhinoceros (Coelodonta antiquitatis), thick-jawed giant deer (Megaloceros pachyosteus), sika deer (Cervus grayi) and gazelle (Gazella). The geological age is younger than that of Locality 1, ranging from 200,000 to 100,000 years before present.